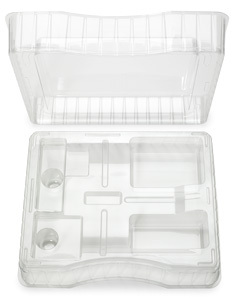 Thermoformed packaging trays can be a single hinged part or as simple as an opened, flat-bottom tray. In some cases, a two-part thermoformed design not only functions to stow specific shapes for individualized items, but serves to keep the items in place with a thermoformed lid. In the image on the right, the raised components fit securely in the bottom tray, but the top tray is lowered into place covering and giving added protection to the raised contents. Using the packaging tray in this image, a consumer good was safely packaged and transported to retail shelves.